The correct laying of the garden depends on the survival rate of trees and yield. For your garden choose the flat or slightly sloping area with fertile soil, convenient for machine processing. Well suited for the fruit garden the land on which were grown clover or vegetables-root vegetables. Before to do planting fruit trees, you must plan properly land: allocate space for a vegetable garden (if they cultivated some vegetables) and the rest, to mark the place for future flower beds and smash the track. The illuminated area should be left for the berry bushes. The areas for planting trees should be Sunny and without flooding. They are clearing of stones and weeds, and then make a marking of planting pits, keeping a distance of 3-4 meters, with the trees grow. It is important to mark the direction of the series: on level ground they come from the North to the South, and sloped across to prevent soil loss. Fruit trees pick up on the number of planting holes. If they are small, take one tree of each variety, taking into account their different periods of ripening. One-grade low-yield gardens, so pick up different sorts of trees and are planted in rotation. 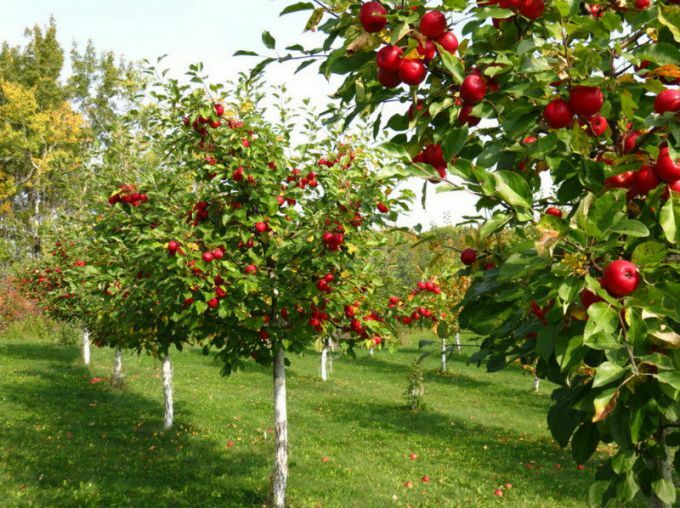 The minimum set of fruit trees consists of early and late cherries, a couple of apples, pears, plums and quince. After some time, when the trees take root and the garden will grow, you can add some fruit varieties with the help of vaccinations. Buying fruit seedlings, take into account regional climatic features, selecting the most resistant species. It is important to consult with experienced professionals or gardeners. When buying plants, take into account the smooth tree trunk, smooth bark and good condition of the root system. The crown should consist of three branches at least, which are evenly spaced on the trunk. A different kind of damage should be absent. Trees are planted in the ground in spring before the buds swell on them. 24 hours before planting the root system of seedlings is soaked in a growth stimulator, then dipped in clay mash. After landing in the prepared hole, the tree is filled with water. Its root collar should be a few inches above the ground surface. When the garden is planted, it remains to take care of his fence, to protect the young plants from strong winds. If done correctly, then a month will see visible results of hard work: the trees turn green young foliage.